1.Just scan the QR code in the manual ,you can download an App with color select, light mode select, brightness adjust and other functions,and follow the manual , you can control the light on your phone. 2.There is a tape mode in the app, if you select this mode, the flashing light can join the music, Depending on the genre of music, the color can change and the light can adapt to the rhythm, and create the dynamic atmosphere for you. 3.All colors are available, the product actually provide you a color disc , break the limitation of traditional remote control, you can find any color you like on it. 4.We improve the stick peel the back 3M double-sided tape, you could paste the light strips in bedroom, car or dining room. And just plug the led strip and download the App to connect it, then you can use it anytime you like. 5.Various applications: Eg dining room, bedroom, kitchen, desk. Especially for holidays and events like Christmas or Halloween. Choose ALED LIGHT ,Choose Better Life! One year warranty, if any problem in a year, you can request the return, replacement or refund. As we are and professional seller of quality in RGB LED Strips market, we do our best to offer the best service to all our customers. The heat will concentrate if the strip was in a roll. All the strip will get hot if you do so. The right way is, spread out the strip in a line and we do not recommend to powered it over 8 hours. It should be cooled after using for several hours. ❤ Remote control with blue-tooth tech :Compatible with all kinds of smart-phone,Android/IOS. The remote distance reaches 10 meter. ❤ Music rhythm synchronization: The light effect of the LED Strip 5M can follow the music or sound record. ❤ Millions of Color Possibilities : All color select-able of this RGB LED Strips . ❤ Easy&convenient installation: We use 3M sticker for this LED rope lights, more stable with better quality. 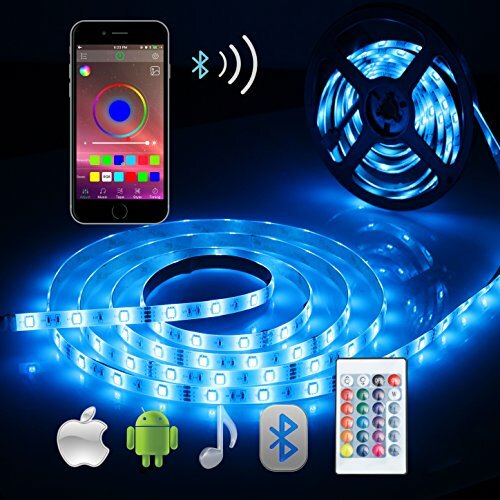 ❤ Bluetooth LED Waterproof Lights: The led strip is covered by EPOXY, which means you can place it in outdoor or bathroom ,never worry about water splash or bad weather like rain or snow, only one note : the led strip is waterproof but the power supply is not. If you have any questions about this product by ALED LIGHT, contact us by completing and submitting the form below. If you are looking for a specif part number, please include it with your message.